3rd Quarter: (S) Drew Naisuler 1 yard rush, 2pt failed; (S) D. Naisuler 3 yard rush, Juvan Elisma 2pt rush. 4th Quarter: (F) Anthony Capachietti 4 yard rush, XP missed; (F) Mark Clagg 47 yard pass to Devin Hassett, 2pt failed. Milford, 0 @ Canton, 1 – Final – Paolo Ruggeri scored the lone goal of the game in the first half off a Griffin Roach free kick, with the ball hitting the underside of the bar and crossing the line. Mansfield, 9 @ New Bedford, 0 – Final – Mansfield’s Emily Vigeant, Cassidy McMahon and Allison Reef each netted a pair of goals while Hannah Reiter, Stephanie Kemp and Emma Goulet each scored once for the Hornets. Franklin, 1 @ Bishop Feehan, 3 – Final – Franklin head coach Kate Horsmann said the Panthers played their best game of the season but fell to a strong Feehan team. Erin Skidmore had 15 digs, eight kills and two aces, Maddie Kuzio had 14 service points, five aces and four digs, Lauren McGrath had 14 assists, four digs and two aces and Maggie Doyle contributed with a strong all around game. 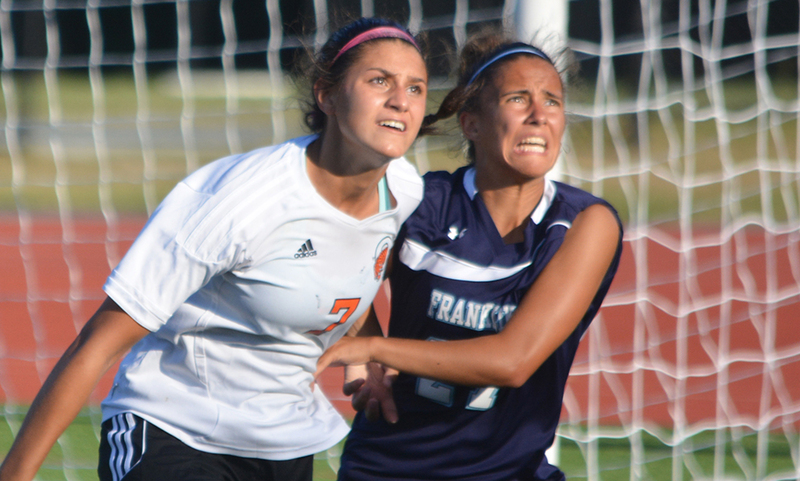 Franklin, 0 @ Walpole, 7 – Final – Dana Lewandowski, Caroline Lounsbury, and Kayla Marshall played well in the midfield and on defense for the Panthers. Franklin, 2 @ Milford, 0 – Final – Farley Asmath scored both goals for the Panthers, with both coming in the second half. Asmath’s first strike in the 56th minute came off an assist from Hatim Brahimi. Asmath then earned a penalty in the final minutes and converted in the 78th minute for his second goal. Fred Beckmann earned the shutout in net. Mansfield, 3 @ Sharon, 2 – Final – Mansfield scored a goal two minutes into the game and one in the final minute of the game to clip the Eagles. James Chotkowski scored early off a service from Max Gurnon but Sharon tied it before half. Mansfield opened the second half when James Cooney headed in a cross from Chotkowski three minutes into the second half but Sharon tied the game with just over three minutes to go. But Mansfield had an answer as Gurnon scored the game winner a minute later on cross from Jackson Murphy. Mansfield goalie Jed Tolbert made 10 saves in net for the Hornets. Stoughton, 1 vs. Norwood, 0 – Final – The Black Knights used a late second half goal to edge Norwood and earn their first win of the season. Matheus Santos took a feed from Jordan Asnes and beat Norwood’s goalie from the top of the area for his first career goal. Head coach Aaron Salter said goalie Matt Gallagher played excellent and deserved the clean sheet. Sharon, 1 @ Mansfield, 5 – Final – Mansfield had five different goal scorers on Wednesday. Allee Bezeau, Stephanie Kemp, Emma Goulet, Cassidy McMahon, and Hannah Reiter all scored for the Hornets. Emily Vigeant and Emma Oldow each had two assists for Mansfield. Sharon, 3 @ Attleboro, 0 – Final – Sharon won 25-18, 25-22, 25-14. Cori Jermyn and Jess Allan led the Eagles with five kills apiece and Natalie Kane had four blocks. Canton, 1 @ King Philip, 3 – Final – Canton took the first game but King Philip came back to claim the next three and the win (18-25, 25-12, 25-18, 25-21). Sydney Phillips led KP with 12 kills and nine service points while Emma Lopez also paced the offense with 11 kills. Carly Adams had a strong serving day with 16 service points, including three aces while Liv Balduf added 10 service points. Amanda Loewen had 12 digs to lead KP defensively. Canton’s Hannah Jerrier, Nicole Poole (22 asissts) and Erika Lum each had six kills for the Bulldogs. Foxboro, 0 @ Franklin, 3 – Final – Erin Skidmore led the Panthers with 11 kills and added three aces. Lauren McGrath had nine aces and 15 assists for Franklin, while Meaghan Maguire chipped in with seven kills and a block. Stoughton, 0 @ Mansfield, 3 – Final – The Hornets won in straight sets, beating Stoughton 25-17, 25-15, 25-22. Julia Harrison had six kills and seven service points, Chloe Peters had 29 assists and seven service points and Anna Kemp and Jolie O’Neil each had nine service points. North Attleboro, 0 @ Oliver Ames, 3 – Final – Oliver Ames got the sweep, winning 25-16, 25-11, 25-18 over North Attleboro. Kayla Raymond led OA with nine kills, five total blocks and three aces. Other standout players include: Senior setter Bridget McCarthy played strong with four aces and 22 assists. Sharon, 0 @ Attleboro, 10 – Final – Grace Mayer found the back of the net four times in Attleboro’s big win. Canton, 1 @ King Philip, 2 – Final – Canton took the lead in the first half with Andrea McNeil converting off a corner but KP rallied for a pair of second half goals to get the win. Liz Furfari tied the game at the 23 minute mark off an assist from Nicole Connor. 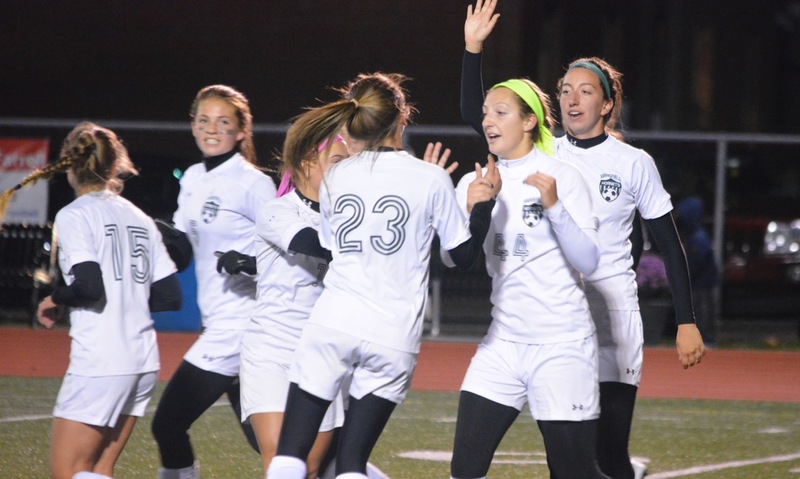 The Warriors found the winner with just three minutes left when Alli Meehan scored off a penalty corner from Christina Hathaway. Foxboro, 0 @ Franklin, 3 – Final – Caroline Lounsbury scored the opening goal with 17:55 left in the first half off an assist by Cassi Ronan and it turned out to be the game-winner for Franklin. Brayden Downing scored two minutes later on an assist from Annie Walsh and then Walsh made it 3-0 early in the second half off an assist by Maeve Ledwith. Christina Lucini earned the shutout in goal with three saves. Stoughton, 1 @ Mansfield, 5 – Final – Mansfield had five different goal scorers in the win. North Attleboro, 0 @ Oliver Ames, 0 – Final – Oliver Ames’ offense kept knocking on the door but North Attleboro goalie Liz Morehouse wouldn’t break, notching 14 saves in an impressive performance. “OA had a variety of pressure on the net…flicks, drives aerials and she stopped them all,” North head coach Karen Folan said. Katherine Munley also had a big defensive stop late in the game for North Attleboro. Katie Davenport and Katie Vamosi anchored Oliver Ames’ defensive effort while Dimitra Efremidis and Kendall Clifford played well in the midfield for OA according to coach Abby Tepper, who also noted the strong game by Morehouse. Attleboro, 184 @ Franklin, 159 – Final – The Panthers got an even par 35 from captain Bryan Woelfel and a 40 from Eric Civetti. Attleboro was led by Corey McKenna, who shot a 42. Taunton, 174 @ Oliver Ames, 149 – Final – Brady Allbritton led the Tigers with a round of 35, while Ryan McGarry shot a 36, Thomas Walsh shot a 37, and Tate Hadges shot a 41 for OA. Taunton got a 38 from Mike Volkman and a 42 from Jake Crawford. Sharon, 169 @ Canton, 152 – Final – Canton’s Matt Minichiello shot a medalist round of 37 to lead the Bulldogs. Jack Goyetch and Joey Vaughan each shot 38s and Pat Duggan and Jackson Maffeo each shot 39s for Canton. Sharon was led by Corey Carter’s 41, while Max Avertin and Max Brody shot 42s for the Eagles. Milford, 170 @ North Attleboro, 162 – Final – Robbie Congdon was the low scorer for North at Heather Hill with a round of 37.